A Memorandum of Understanding between German University of Technology in Oman (GUtech ) and International Maritime College of Oman had been signed on the 17th of May 2016 at IMCO Campus The purpose of this MoU is to develop research and educational cooperation between GUtech and IMCO. 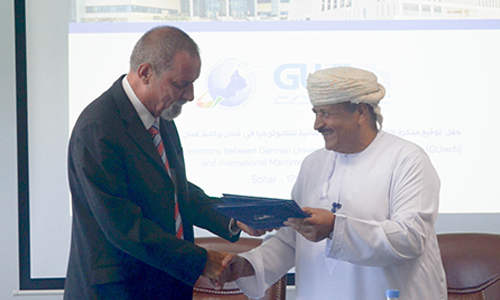 The Rector of GUtech Prof. Dr Michael Modigell, and Dr .Hilal Ali Azzan Al Hadhrami, the Dean of International Maritime College Oman, signed the pact at a function agreed to closely collaborate to Carry out joint research and development projects with particular emphasis on nationally funded projects. The MoU strives to exchange information related to their research and development activities in fields of mutual interests.